Guess what arrived in the mail today? 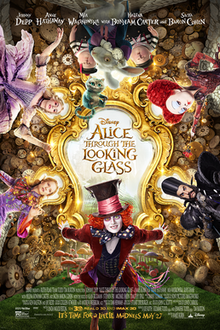 The graphic novel adaptation I wrote of the 2016 film Alice Through the Looking Glass. My adaptation of Linda Woolverton’s screenplay merges with an adaptation of the first Alice in Wonderland film to form DEVASTATOR! No, actually, they merge to form Alice in Wonderland: The Graphic Novel Collection, which you can pick up now in time for the holidays if you are so inclined. The collection includes hopefully not embarrassing pages from the comic script I wrote, showing how the work turned from words to image. The artwork for the story comes from Massimiliano Narciso, along with lettering from Brandon DeStefano and editing from the inimitable Jennifer Hale. If you liked the movie, or even if you haven’t seen it, it might be worth a look to see how an artist other than the director (James Bobin after Tim Burton) takes the subject matter.